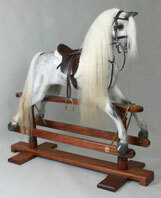 The Rocking Horse comes in many forms and we have a variety of rocking horses for sale. There are many distinctions. The most fundamental revolves around the materials used with wood, fibreglass, fur fabric (plush) and even plastic being used. 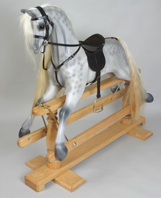 The classic wooden rocking horses remain the most revered and we are often asked where can I buy a traditional wooden rocking horse? We can help with that! Beautiful Victorian rocking horses were orginally hand-made by Victorian and Edwardian craftsmen, usually working for small companies. The dapple grey was the overwhelming favourite. Nowadays, modern makers are no less in love with the dapple, but polished wood is also a favourite, particularly for adults. They are tacked-up with the finest authentic removable English leather tack. 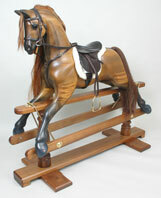 UK antique rocking horse restoration and repairs of antique rocking horses is available. Each of the rocking horse restorers we recommend has many years of experience of rocking horse renovation and repair and the rocking horse repair service covers much of the UK. "Europe's Favourite Rocking Horse" from Kensington Rocking Horse Company is probably the world's finest choice for a very young child. This beautiful creation is hand crafted from beech wood. This little favourite is beautiful, strong and stable and has won many awards. The optional leather saddle and bridle shown in the photo add lovely finishing touches. This would be your choice as a fine example of both design and craftsmanship in heirloom quality in an age where mass-production of disposable and low-quality products has been holding sway. English rocking horse making dates back to the earliest Victorian times and Victorian rocking horse are made in this spirit. 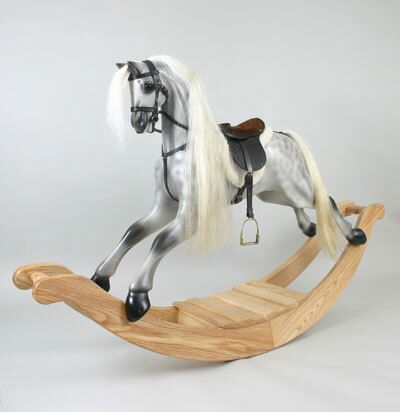 The finest of seasoned timber is carved by experienced British professional rocking horse makers and made into exquisite rocking horses. 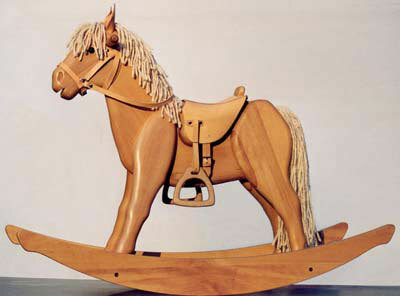 A rocking horse are made on bows and safety stands (gliders). They can be made in the antique style or a more contemporary finish. 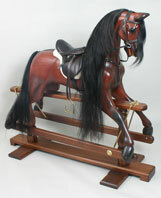 In the past, a Victorian bow rocking horse was made on deep and lively bows! Nowadays, the bows are designed to be exciting, but not scary in the way that they used to be in past times! For more details, please see the rocking horses page.